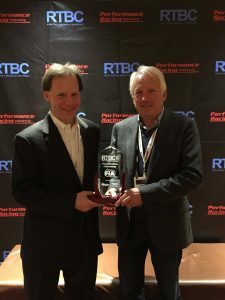 FIA’s Charlie Whiting Receives Award At RTBC – 2015! The Race Track Business Conference presented a special recognition award to Charlie Whiting – FIA – Director of Formula One. The plaque was presented by National Speedway Directory and Track Guide at the Performance Racing Industry Trade Show. “Being recognized is special. Industry events are an opportunity to gather with peers and discuss importants topics involving motorsports,” said Charlie Whiting, FIA – Director of Formula One. “We were honored to have Charlie Whiting join us at the Race Track Business Conference. His contributions to the industry on safety, event management and technical issues are instrumental. Everyone benefits from his knowledge and dedication over the years.” said Tim Frost the organizer of the event. From his early beginnings as a chief mechanic and race engineer with Brabham Formula One, Charlie Whiting, was part of two driver’s World Championships with Nelson Piquet. For over twenty five years, he has served in various capacities at the FIA. They include F1 Technical Delegate, FIA F1 Race Director, and Safety Delegate. He is responsible for the FIA F1 technical department, and is a member of the FIA Open Cockpit Research Group, FIA Safety Commission and the FIA Circuits Commission.